The world first came to know regarding the existence of the manuscript on Vimanas by Maharishi Bharadwaja through the report of Shri K N N Sastry the Mysore representative of Press Trust of India, filed on 25.08.1952 and published in all the leading dailies of India and later picked up by the other dailies of the world. Later in September 1952 another article which received wide attention is the reported successful experimental flight of MARUTSAKHA Vimana by Shivkar Bapuji Talphade in the year 1895 on the Chowpatty beach in the Vande Matram a Gujarati Daily. However highly informative article on Vimanas coupled with in depth analysis by the Late G V Ketkar, the learned Editor of Kesari and Maratha of Pune, few days later went unnoticed by the Press. I have drawn much of my information for the present article on Ketkarji’s articles.I wish to place on record my sincere thanks to Dr. D J Tilak the Editor/Trustee of Kesari for having permitted to use the material for my research. Shivkar Bapuji Talphade: The current story regarding Shivkar Bapuji Talphade is that he successfully flew an unmanned plane named Marut Sakha in the year 1895 in Mumbai on basis of his study of Rigveda Richas and the commentary of Maharishi Bharadwaja thereof. According to investigations carried out by me, the first New Light On Vimana Shastra reference to experimental studies of Marut sakha appeared in an article authored by Mr. Lalubhai Kansara of Valsad in an issue of Vande matram, a Gujarati Daily in September 1952. A similar story was published in Maratha on 3rd October 1952, the Pune newspaper under the caption ‘First inventor of Aeroplanes an Indian The article starts as under The Vividha vritta:’ a well known Marathi weekly published at 364 Thakurdwar Bombay 2 in its issue dated 14th September 1952. On page 9 gives the following information in an article with the above caption. Shivkar Bapuji Talaphade a teacher in the School of Arts and a scholar of Vedas and Sanskrit demonstrated an aeroplane he prepared according to the vedic mantras at the Town Hall, Bombay. As this was highly appreciated by the public he continued his researches. In the year 1895, he prepared an airplane named Marut Sakha based on Bharadwaja’s work on this subject, and demonstrated that it could reach nearly to an height of 1500 ft. in the presence of the Great Sayaji Rao Gaikwad, the then Ruler of Baroda, the late Justice M.G. Ranade and Late Lalji Narayanji a prominent merchant of Mumbai .They were very pleased with the equipment and gave reward to the inventor. The author of Vaidik Sampati (1932) in his work has stated that according to Amsubodhini there are eight types of Vimanas ,Marut Sakha been the eighth. Luckily in Bangalore I was able to get a photocopy of Pandit Subbarya Shastri’s(expounder of Vimana Shastra) autobiography and a photocopy of Bhautik Kala Nidhi due to the kind permission of the Late Dr. B V Raman(in this the kind help of the Late Dr.S R N Murthy is acknowledged) . In his autobiography (published in 1972) ,Shastriji states that he made a trip to Bombay to help Dr.Talphade in his experiments on Vimanas and that he died while the experiments was going on. Shastriji also states that Dr. Talphade could have been aware of his work on Vimanas through newspaper /magazines based on his lectures on Vimanas . (This is corroborated by an article published in Bhautik Kala Nidhi(BKN), a monthly on Vimanas from January 1911.) On analysis of the autobiography, this incident can be placed between 1917-1918. According to available records Talphade died on 17-09-1917. The air possesses heat and velocity. These two can be separated with the help of certain Yantras (machinery) as mentioned in the Yantra Adhyaya . The air contains Seethaghana and Ooshnaghana or condensation by different process of cold and heat. All those Vimanas which can be worked by Ooshaanghana after destroying Seethaghana go under the name Marut Sakha Vargam. Shastriji gave detailed information on Vimanas to Dr. Talphade during his personal meetings as stated in the autobiography. Sri Sastry was prevailed upon by Sri Puttanna Chetty , who was an ardent admirer of Sri Sastry , to produce blue prints of the Vimanas he was talking about and he did with few notes. When Lord (then Mr.) Montague visited India in about 1918, this subject was put before the Government in Bombay by a Parsi gentlemam with the result Sri Sastry was put under arrest and only influence with the highest level could save him from further prosecution. Naturally from that time onwards ,caution made him talk that he was only a theorist. A letter of Sardar M V Kibe, of Indore. published in Kesari on 24.10.1952 and refereed to by Ketkarji states that the Late Purushottam Vishram Mavji wanted to conduct experiments on energies used to run the Vimanas. He intended to spend one crore rupees for the same. Due to loss in his business and his death in 1929 the project did not take off. Mavji been influenced by the above experiment by Dr. Talphade cannot be ruled out . It may be noted that Mavji had helped Talphade financially earlier and stopped the same after a scientific review of his work (Ref :Kesari 10th May 1953, Article by Pandit S D Satawelekar) It may be noted that according to the autobiography a publication committee was formed in Mumbai to publish the works available with Shastriji. immediately after the death of Dr. Talphade. This is a pointer to the fact that Dr. Talphade’s experiments results were encouraging and not a failure as claimed by some scholars. the rich ancient scientific tradition available with Shastryji from January 1911 onwards. The scientific and research community should be thankful to Late Prof B Suryanarayana Rao founder editor of Astrological Magazine for having discovered a Gem called Pandit Subbarya Shastri for us. Subsequently Shastriji came into contact with people. He was appointed as a Lecturer on Hindu Religion subjects by the Government of Mysore on 27th November 1902. This disproves the theory that he was not a Pandit. This Shastra in 8 chapters is expounded by the revered Bharadwaja Maharshi. In it the 28, 339 kinds of vehicles and yantras useful in traveling on land, 783 kinds of vehicles such as Nauka, Dauka, Dola, Jala, etc useful in visible and invisible voyages on the surface of water, below water, on the land below water etc., in seas, oceans and like ; the 101 varieties of air-ships classed under the three groups viz. Mantric, Tantric and Kritaka or artificial ones, useful in flying in air by the celestial beings, Gandharvas, Yakshas, Rakshasas, Kinnaras, Kimpurushas, human beings and so on ; machinery and others appliances to produce and store one thousand kinds of electricity of subtle, gross, visible invisible kinds; machines which attract metals such as gold, copper, silver, iron etc; Printing press, Lethographs, Paka, Yantra, Kuttinee yantra, Shodhana yantra and also machines to extract oils, acids, essences etc and those which attract sound, likeness of things (photographs), shadows, ideas, transmitting messages etc are dealt with. According to Shastryji Madhusudana Sarawati, a learned personage who lived eight centuries ago revived the scientific texts from the bits available in his time and wrote the Prastana Trayee . This text gives information of about 42 scientific texts of ancient India. I request scholars to study this work and come out with their conclusion. It may be noted that the above classification form part of the sixth chapter from the 63 rd adhikarna onwards. From this is clear that till the 62 nd adhikarna the actual working of Vimanas has not been discussed. The present published texts gives the description of 4 Vimanas not mentioned above. The adhikarna list mentions them. Except Tripura the others are not even mentioned even as adikarna. They have been mentioned as part of Jatyadhikarna(varieties of aircrafts).It is quite possible that he would taken it from some other commentaries to give a better picture of these aircrafts. The English portion of this work is only a commentary and not a translation in the strict sense of the term. For many of the explanations of the original sutras or aphorisms , not found in the Bodhananda’s commentary given in this work , have been taken from other commentaries on the work , by the expounder of this shastra, Pandit T. Subaraya Shastriji, who is therefore the real translator of this work. This can be applied for Vimana Shastra as well. It is well known that the late G G Joshi took the reported experimental studies on Marut Sakha as a non event, based on Pandit Satawelekar ‘s article in Kesari(10 May 1953. It appears that he did not have faith in the contents of Vimana Shastra due to its Yogic origin. However present experimental studies shows that it is quite possible that the successful experimental studies on Chumbak Mani based on Vimana Shastra conducted at IIT Mumbai in the seventies was not known to him and autobiography of Shastriji not available to him. Had it been known , he would have revised his stand. (The article on Bhamani published from Thanajavur was in his collection . )This however does not lessens his contributions to ancient sciences. He will always be source of inspiration to me. In short we have to conclude that Talphade was the first experimenter on Vimana Shastra. In this regard it is worth mentioning that the late S V Shetty wanted to construct a modern plane in 1916 for which permission was denied. In this background the experiment may have been known to a limited circle. It is possible that Kansaraji got his information from this circle as the Marut Sakha been the eight aircraft is correct . Use of solar rays as a source of energy has been mentioned by Kansaraji. This was not known to modern science when Kansaraji wrote his article in 1952. 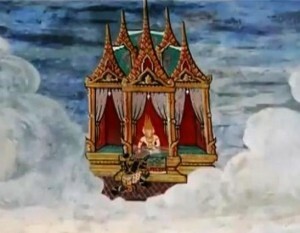 However as stated above Chumbak Mani was prepared on the basis of Vimana Shastra. Hence Kansaraji’s article cannot be dismissed outright. It is necessary to make further research to see whether Kansarji wrote any article giving the source of his information. The readers are familiar with the metallurgical and ceramic marvels of Vimana Shastra. However constructing a Vimana is still a distant dream given the little information the present published texts gives us. In this background had the present scholars/scientists access to Talaphade’s notes, things would have been different. I request scholars specially from Mumbai , Bangalore and Chennai to trace Shastriji’s and Talaphade’s writings and notes. I have not been able to incorporate all the information, given the space constraints. Presently I am trying to collect all published works of Pandit Subbaraya Shastri. I request readers to help me in this regard. Any constructive criticism / comments on the article are welcome.